The myth can have a greater effect than an untruth, and those who are in the business of manufacturing and building them never go out of business. 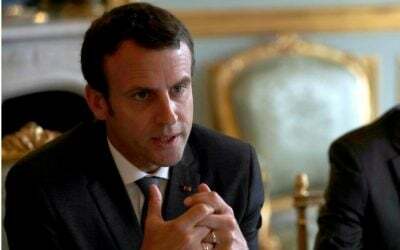 France’s President Emmanuel Macron has, for months, busily promoted a new myth: that of being European saviour, the man with healing visions and supportive panaceas, a counter weight to the toxicity of Trumpland. Things, however, have been rocky. The sheen is coming off, as it was bound to. He is slumming at approval ratings similar to the man he replaced, François Hollande, at around the same time of his tenure. (That is hardly surprising, given that his victory over Marine Le Pen was very much a vote against her, rather than a full hearted endorsement for the youthful opportunist.) He is overseeing a salad-days assembly of freshly elected candidates that make the radical project for renewal less than smooth. This has led to such cosmetic gestures as the speech on Pnyx Hill in Athens, delivered with the note of warning we have come to expect from the former banker. “In order not to be ruled by bigger powers such as the Chinese and the Americans, I believe in a European sovereignty that allows us to defend ourselves and exist.” So, from this ancient summit of previous assemblies conveyed in antiquity, Macron reflected and even directed. Central to this is a collective, even civilizational one: Europe, together, wary and ready to combat any threatened sandwiching, or even absorption, by other powers. “Are you afraid of this European ambition?” he asked rhetorically. One way of doing so is to draw out the populist sentiment, the cynics, the sceptics, and anyone who feels that the European bloc has begun to drift into bureaucratic, self-imploding oblivion. When a crisis develops and takes hold, the managers and public relations terms counter with a “road map”. This is Macron’s hope: to generate some form of plan that will convince European leaders to open the floodgates to public debate. Gather, insists Macron, the views of European citizens on the bloc. The European vision Macron insists on pushing is a turbocharged version of centralisation, integration and consolidation, coated with a good amount of liberal market philosophy. It breathes and sings (in so far as visions can) to the same song sheet that populists have trashed and suspected. It panders to a market vision in a manner that edges out, rather than brings in, the social welfare softening that might dull revolution. His proposed reforms also entail bowing, in some small measure, to the critics Europe’s mobility principle, which he feels has been unduly exploited. The European Commission’s “posted” workers directive, for instance, permitting companies to dispatch employees to other EU countries while still paying taxes and benefits in their own country, is being flagged for reform. To totally remove it would be tantamount to violating a key feature of the EU bloc, so Macron and his tacticians prefer what might euphemistically be termed tightening. The reason for this, claims Macron, is that cheap labour from member states located in the east – the old story of the European integration project – tends to flow to affluent western states. The result is, horror of horrors, unfair competition and spectre of unemployment in the west. As part of his central and eastern Europe visit, Macron deemed Europe “a region created on the basis of values, a relationship with democracy and public freedoms which Poland today is in conflict with.” Conflict, in so far as Poland has shrugged off suggestions that it should accept migrants from the Middle East. Closer to home, the troubles are not better for Macroland and its adherents. One political thorn, and getting thornier by the day for the Macron project, is that figure of the French left, Jean-Luc Mélechon. His La France Insoumise (France Unbowed) movement, it can scant be forgotten, received a respectable 20 percent of the vote. For him, Macron is the target, to be repelled and contained by means of an insurrection. Some voters, if one is to take the polling of Paris Match and Sud Radio seriously, suggest that Mélechon is even more of a formidable obstacle than the Front National. Should he going with any degree of impassioned enthusiasm, Macron may well find himself not only short changed but outdone.